When the client loads, your mod downloads vorbisspi-1.0.3-1.jar every time, even if it is. The radio-tuner has no texture. The mod is just super, please correct the problems described above. The mod hasn't *downloaded* anything in quiet a long time, it extracts its dependencies from within itself on every run to make sure they're valid. Also I can't reproduce any texture issues on 0.1.0.13 the Radio Tuner texture is fine for me in dev, and in built versions. In my client there is protection for changing files in the mods folder. The client downloads the dependencies for your mod from the server. Your mod rewrites them and the protection thinks that someone replaces the files and does not let the client run. You can do a dependency check so that your mod does not extract them if they already exist? Well, that sounds like a setting you may need to look at disabling, so that mods can handle their own dependencies, mine is hardly the only mod that does this, in fact this code is based on ChickenBone's deploader. RE: Your screenshot. https://drive.pc-logix.com/index.php/s/JYf4ANm2tiGexcF As you can see here, in 1.12.2 the tuner item has a texture with no issue for me. I took a quick peek in the mod jar and noticed that the file is there but is named ItemTuner.png (case sensitive). Renaming the file in the jar to lower case fixed the texture error for me. As you can see from my screenshot I can't reproduce that... though I am using locally built versions of the jar. The issue is on git the texture is ItemTuner locally it is itemtuner and my git client doesn't push the changed file name when it is just a case change. I'll fix it in the next build. After almost a full year pesting you to update for 1.12.x, i felt obligated to came here first to THANK YOU SO MUCH for this update. You dont know how amazing is this mod! I was waiting for this for a long time!!! The hero we need, but don't deserve. 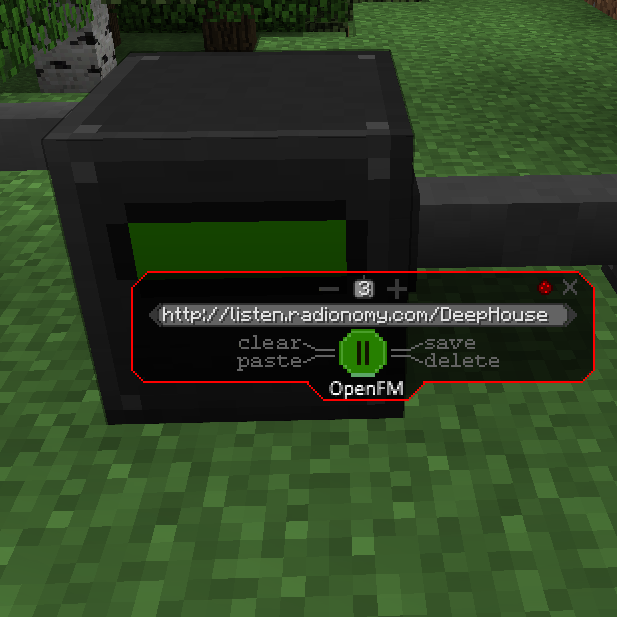 The test link is no longer working right (I think) is there some alternative to radionomy that you would use... I do not know any services that stream music for free in the way this needs. Please reply at your earliest convenience. Lots of the stations here https://www.internet-radio.com/ work, though it's a bit harder to get working URLs... you have to click the pls link, which will download the .pls file, then you have to open it in a text editor, paste the url from that file in your browser, which will download ANOTHER .pls which you then open in a text editor, and get the URL from the 2nd file, and put in the OpenFM URL field. Sadly the 2 redirects confuse OpenFM and I've yet to figure a way around it. i am working on an modoack, are there any plans for working on a 1.12. * version ? This is amazing and I thank you for your effort! I don't know why it don't work, someown can help me ? It looks like you're trying to use 1.11? There is no 1.11 version of OpenFM. you resolve my problem, thank you ! I need some help , when i place the radio without opencomputers it work i test some radio stations and they play perfectly but if i click save the radio dont save the stations, iff i broke the radio and placeit again theres no radio stations , so i try to conecting the radio to OC , (Im really really noob with OC) so if i type components it show the openfm_radio as a component but if i type fm = components.openfm_radio its show fm = File dont found :( , im sorry for the total noobness here , if someone can point me to right direction on where to start . When you break the radio it loses the saved data, there is a memory card you can place in a slot in the radio and save trhe stations to, then restore them on a new radio. when using OC if you want to use lua commands directly you have to entre the lua interpreter first so type lua, then type the commands above.